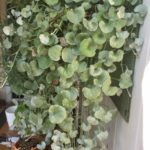 My dichondra is a few months old and has grown to about 1 metre. It was looking beautiful we went away for 2 days. I came home and it has browned off on the top. Is there something I can do to save it? Could you upload a photo so that I can better see what is going on? This could be many things. Can you tell me a little more about the environment around it?